President Donald Trump speaks from the Oval Office of the White House as he gives a prime-time address about border security Tuesday in Washington. The president provided no new information — and lots of false information — to try to justify his call for building a wall along the U.S.-Mexico border. He warned Americans to be afraid, very afraid, of immigrants. This is straight out of his tired playbook, but not supported by facts. 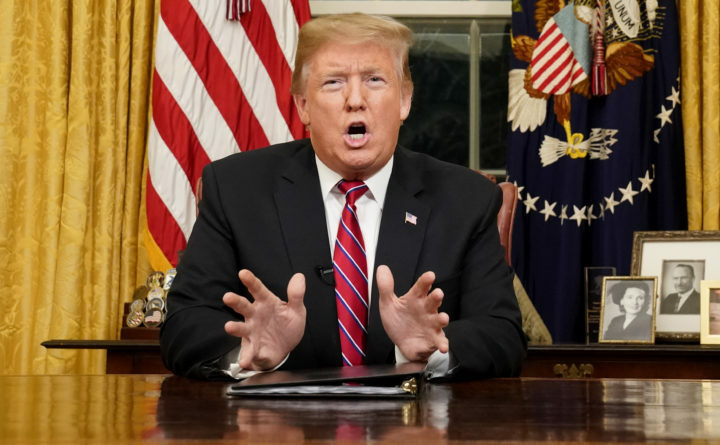 He described a crisis at the border, which he largely blamed on Democrats, but failed to explain why there wasn’t a crisis last week or last month or last year, when Republicans controlled both chambers of Congress. He barely mentioned the ongoing government shutdown, which is a much bigger problem for Americans than what happens at the southern border. And, perhaps most telling, Trump’s campaign committee sent out a fundraising email before the nationally televised speech. The email, which asked recipients to donate to a “border fund,” was signed by Trump. This leads to the conclusion that Trump’s nine-minute speech was less about building support for a border wall and more about perpetuating the fight over a border wall, an issue that his team continues to believe is a winning strategy. Recent polls have found that Americans, overall, oppose building a new wall. Republicans, however, strongly support it. This was reiterated by Trump’s false claim that “the federal government remains shut down for one reason and one reason only: “because Democrats will not fund border security.” There are other avenues. Senate Majority Leader Mitch McConnell, a Republican, could allow the Senate to vote on a House-passed funding bill, which the Senate had approved in December. He says he won’t do so because Trump doesn’t support it, but the Senate could override a veto, which would rightly prioritize a functional government over an endless debate about a border wall. In his brief speech, Trump made a lot of other claims that were simply untrue. He began his speech by describing a growing crisis at the southern U.S. border. He painted a picture of U.S. officials overrun by illegal immigrants. In fact, southern border crossings, both legal and illegal, have decreased dramatically. Illegal border crossings topped 200,000 per month in 2000. In 2018, they numbered just over 40,000 per month, according to data from the U.S. Customs and Border Protection. To be sure, illegal border crossings are a problem, as is the growing number of migrants from Central America who are heading to the border to escape violence and economic hardship in their home countries. Trump has proposed to remedy this situation by cutting off U.S. aid to Honduras, Guatemala and El Salvador, a counterproductive move that would make the humanitarian crisis worse. Trump is right about a humanitarian crisis at the border, but his administration has put in place policies that have worsened this crisis. Unprecedented numbers of families and children are being held at border facilities, which are unequipped to handle them. Although they are classified by U.S. officials as “apprehended,” many of these people are coming to border stations and asking for asylum, which is their right under U.S. and international law. Under the Trump administration, these people are being detained as they await hearings in an already overburdened and understaffed immigration judicial system. Electronic monitoring and community supervision are workable alternatives that are much less expensive. Trump fell back on the common refrain that immigrants are dangerous as he blamed them for America’s opioid epidemic. It is true that most of the heroin consumed in the U.S. comes across the border with Mexico, but most of it smuggled through legal ports of entry. The president also highlighted murders committed by immigrants who came to the United States illegally. These are horrific tragedies we should work to prevent. But that conversation needs to consider the fact that immigrants commit crimes at far lower rates than native-born Americans. There are serious problems at the southern border. Trump’s speech, and constant demand for a wall, does nothing to solve them.